An Easy Guide to Baloney Detection! 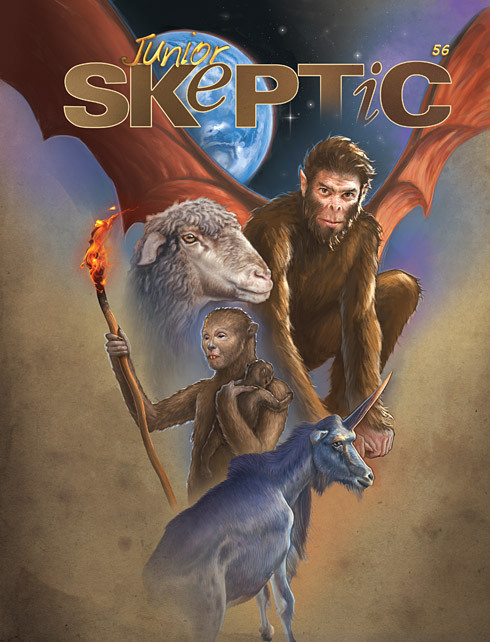 In the pages of Junior Skeptic, we often look at “wild and wooly” mysteries—but today I mean that literally. 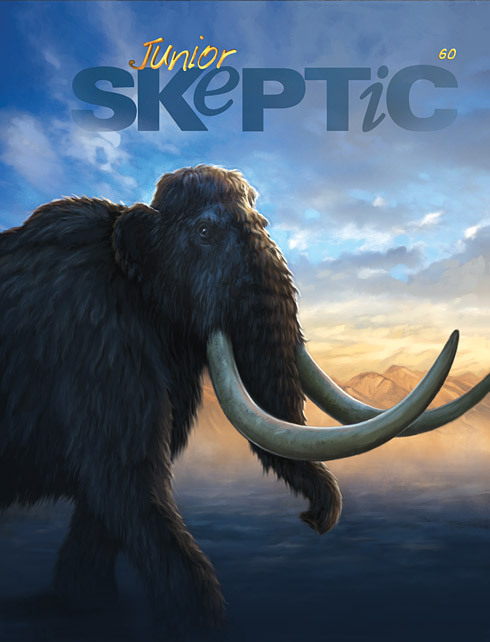 In this issue we’ll explore the hidden history of mammoths and mastodons! The elephant family tree has had many oddly shaped branches. There once existed elephants with four tusks or even tusks shaped like shovels. But fossils of mammoths and mastodons weren’t just surprising—they changed science forever! Indeed, the discovery of these great shaggy prehistoric beasts overturned our understanding of the entire world. How did that happen? Let’s find out! 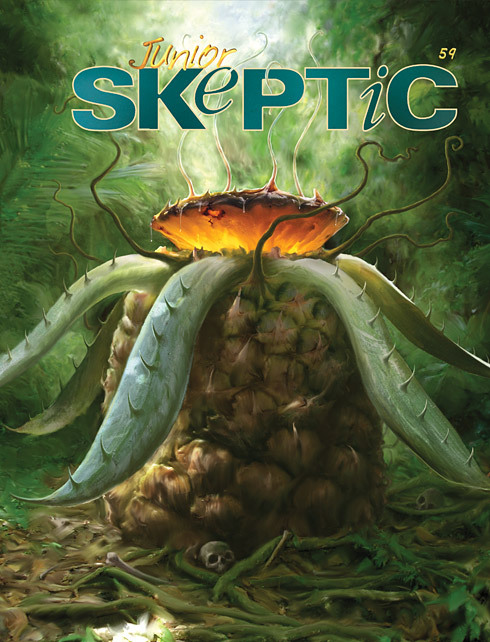 In this issue we journey into jungles, push past tangled vines, and search for something sinister: trees that are said to eat human beings! According to travellers’ tales and newspaper stories, some mysterious plants capture and consume large animals. Growing in remote regions, these bloodthirsty vegetables wait for the unwary, surrounded by the bones of their victims. Their branches stir when there is no breeze. Inviting foliage conceals thorny vines ready to seize struggling prey. Is there any truth to these tales? Could such plants truly exist? Let’s find out! Flying Saucer “Space Brothers” from Venus!? In this issue we’ll hear tales from a man who said he met flying saucer travellers—human beings from Venus and several other planets! Amateur astronomer George Adamski became famous in the 1950s for photographs of objects he said were alien spaceships. His stories only got wilder from there. 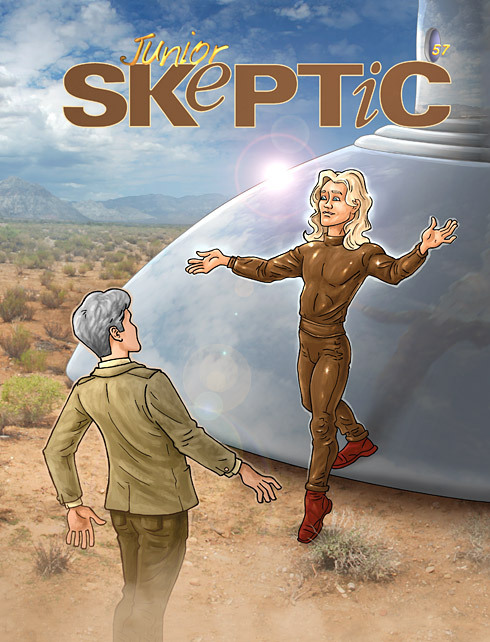 He claimed he befriended saucer people, rode in their spaceships, and even attended a meeting on Saturn. His books about these adventures became a public sensation. But what was the truth behind Adamski’s storytelling? Let’s find out! What’s that you say? The Moon obviously can’t have unicorns because it doesn’t even have air to breathe? Well, sure, that’s a good point. But what if I told you the world’s most popular newspaper once announced the discovery of these and many other fantastical lunar lifeforms? Moreover, people believed those claims. How on Earth were New York City newspaper readers taken in by a far-fetched fantasy about flying Moon-bats? 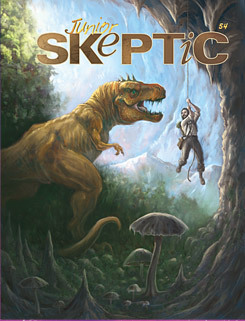 Find out in this issue of Junior Skeptic! 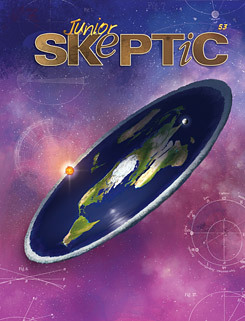 In this issue of Junior Skeptic, we’ll dig down further into wild and wonderful claims that there are secret worlds inside our planet, hidden beneath our feet. We learned last issue that the “Hollow Earth” began as a quirky but serious proposal by astronomer Edmond Halley, back in the earliest dawn of the scientific age. This idea was then promoted by eccentric thinkers such as John Cleves Symmes, who believed the interior could be entered through vast holes at the unexplored North and South Poles. 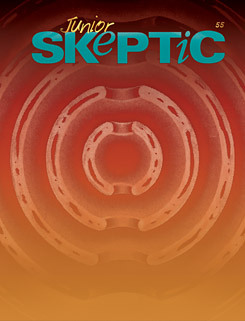 But what happened when exploration and increasing scientific knowledge left these speculations behind? Let’s find out! Could unknown civilizations rule undiscovered realms deep underground? Might prehistoric beasts stalk through jungles far below our feet? These ideas have long inspired writers of science fiction and adventure stories. For example, the 2009 animated film Ice Age 3: Dawn of the Dinosaurs was based on them. But for some people the “Hollow Earth” is more than just a make-believe story. How did people find their way into such a fantastic belief? Imagine if someone were to ask you, “What shape is the Earth?” It’s likely you’d answer “round,” or describe our world as a ball (or globe or sphere) in space. I would too! But what if you met someone who insisted that the Earth is nothing like a ball, but instead is as flat as a pancake? How could they possibly defend such a peculiar notion? And are there really people who believe this? Shortly after it was invented by the slippery Mr. Mumler and his wife, other photographers said they too could capture ghosts on film. Why did so many people believe these claims? If any spirit photographs were genuine—could we tell? 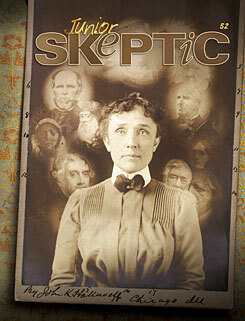 And with tricksters trying to fool people, how could folks detect photographic fakery? 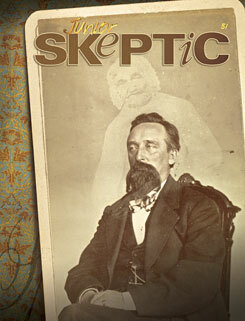 In this issue, we’ll delve into the mystery of spirit photographs! When photography was invented, it seemed almost magical. This astonishing technology could capture a moment and keep it frozen forever. Photographs also showed people things they couldn’t see in everyday life, such as faint stars and distant lands. But could the magic of photography also reveal a hidden reality—a spirit realm of invisible ghosts?